Harriet Elizabeth Grimes was born on 20 August 1816 in Duplin County, North Carolina. She was known as Hattie. She married Albert George Perry, son of Sion Perry and Bertheny Arundell, on 8 January 1832, at the Grimes plantation in present-day Grimes County, Texas. Albert George Perry and Harriet Elizabeth Grimes appeared in the US federal census of 1 June 1850 in Grimes County, Texas. Other members of the household included Mary E. Perry, Eugenia V. Perry, Emma Diantha Perry, Horatio G. Perry, Harriet Grimes Perry, Martha Ann Grimes, Sarah Jane Perry, Theny Perry and Ducalion Aldridge Perry Jr. The latter three were children of Albert's deceased brother Ducalion Aldredge Perry. T. A. Perry (male, age 7) has not yet been identified. Albert George Perry and Harriet Elizabeth Grimes appeared in the US federal census of 1 June 1860 in Marlin PO, Falls County, Texas. Other members of the household included Mary E. Perry, Emma Diantha Perry, Harriet Grimes Perry and Albert Emmet Perry. Albert George Perry and Harriet Elizabeth Grimes appeared in the US federal census of 1 June 1870 in Marlin PO, Falls County, Texas. Other members of the household included Harriet Grimes Perry, Albert Emmet Perry and Martha Eugenia McDonald. Also in the household was Mary Keef, age 8, not yet identified. Harriet Elizabeth Grimes became a widow at the 22 March 1874 death of her husband Albert George Perry. 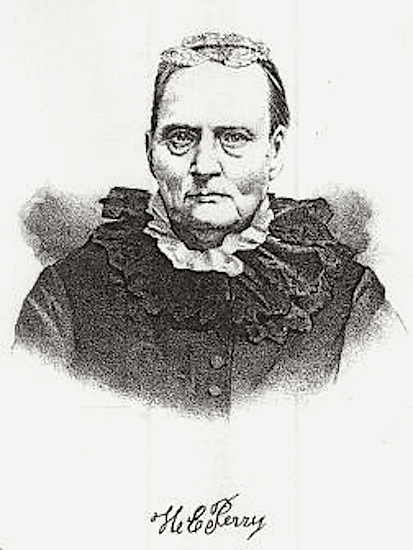 Harriet Elizabeth Grimes died on 14 September 1888 at age 72 in Perry's Landing, Falls County, Texas. She was interred at Beulah Cemetery, Falls County, Texas, between Marlin and Lott.